Lynchburg, Virginia is located within a 60 minute drive to the Blue Ridge Mountains, the Appalachian Trail and numerous other smaller trails found along the mountain ridge and the James River. Are you ready for an invigorating walk in the woods? This time of year is the ideal time to do a scenic fall hike and enjoy the colors! Looking for an easy walk or a more strenuous hike? Either can be found and will allow you to enjoy the beautiful fall colors, scents and sounds. Remember to pack your sunscreen, snacks, plenty of water and your camera. You never know what beautiful or unexpected sight you may see. Peaks of Otter Trails. There are seven trail options to choose from, ranging in length from .8 to 3.3 miles. Most are easy to moderate hikes. They can be accessed from Peaks of Otter parking at the Blue Ridge Parkway Mile Marker 86. You can research these trails by searching “Peaks of Otter Trail Map” online. There you will find the trail names, lengths and difficulty ratings. The James River Footbridge trail is an easy hike that follows the James River, then a tributary that leads to an Appalachian Trail overnight hut Wonderful, peaceful scenery will be found. This hike is about 4 miles in length, out and back. 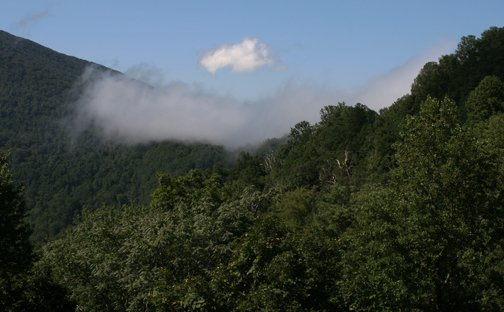 The trailhead is located on the Blue Ridge Parkway near Snowden, about 20 miles northwest of Lynchburg. Crabtree Falls. This moderate to strenuous hike is about 4 miles long, each way. Offering views of the highest vertical-drop cascading waterfall east of the Mississippi, the five major cascades and several smaller drop a total of 1200 feet. The first overlook is near the parking lot along a gentle paved trail. 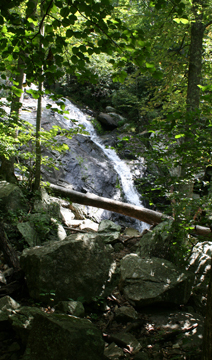 More adventurous hikers can continue along a 3mile trial to spectacular views of Crabtree Falls and the Tye River Valley. Please beware and heed the signs, do not go off the trail to get a better picture or to see the falls up close. Every year at least one person falls to their death on the slick rocks and uneven terrain. Apple Orchard Falls. a challenging 2.5 mile hike-out and back. The trail descends 2000 feet to a 150-foot waterfall, but remember the return hike is all uphill! Be sure to take water and food with you. This trailhead is located about 7 miles north of Peaks of Otter. We have hiked most of these trails. Some are more of a challenge than others, but all offer spectacular scenery, beautiful woodlands and some days views to eternity. As mentioned earlier, do not forget to take your water with you. And remember to stay on the trail, so that nature can be saved to be enjoyed by others. Have fun and hike safely! If you are staying with us at The Carriage House Inn Bed and Breakfast we can make arrangements to provide you with a picnic lunch, snacks and drinks or other back-packable items to make your day in nature more enjoyable. Just ask us when you make your reservation.